I was maybe one of the few who loved Assassin's Creed I regardless of the repetitive nature of the game. I could spend hours just exploring the cities, admiring the architecture and pointlessly romping around. So I was concerned at the trailers for Assassin's Creed II - it looked like it might be a more regimented storyline. Would AC2 limit your ability to just goof when ever you wanted off for the benefit of a plot? Would the missions be too long and be too convoluted? Would it lose the soul of the first which was exploration first, storyline second? Thankfully all of my fears were unfounded. 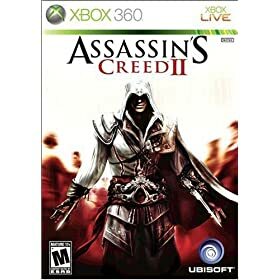 Assassin's Creed II is quite possibly the best sequel in any art media. They've taken the budding roots of AC1 and built a tree - not just any tree but a huge redwood full of branches and interesting knots, twists and turns. And you can explore it however and whenever you want. Missions are short and sweet and reward your character with just enough growth to make continuing with the story preferable, despite the OCD collector in me desperately trying to get out. There's simply so much to do and see and learn about, and such a varied way to do it all. From attacking to defending, stealth-play to exploring, everything is bigger and better. Even load times are faster despite the much more massive cities on offer, and there's no more forced listening to a god-awful cutscene before you can jump-in. Plus avid in-game item collectors such as myself are in heaven - I'd say I haven't seen this much to find in a game since Donkey Kong 64. Thankfully for the most part it's not just a case of randomly stumbling on flags either; now you can buy treasure chest maps for every part of the cities which pinpoint an item's location... and yet still finding some of the chests is still a challenge. Ubisoft have made such a vast game that there's little point in highlighting the features and fun stuff, I'm bound to leave something out. We're talking a 30+ hour single player game here folks. I applaud that duration heartily especially after washing the bitter taste of COD4:MW2's 5 hour SP campaign. So it's clearly it's hard to fault AC2 but it's not impossible... the opening sequence and build up to going back in the Animus is far, far too long and tedious and the mandatory timed missions are the bane of the game (ugh), but that doesn't mean that AC2 is not absolutely THE game of the year and the sequel of the decade. If you were put off by the first not quite working for you then don't hesitate to get this - it completely fulfils the promises of the first game and manages surpasses them beautifully. This is got to be one of the best games I've seen in a very long time. See what we did here with the Call of Duty 2. The Death of #Credit Card?